The Short- Godzilla may suffer from moments of clunky dialogue and a few under developed characters but its slow burn tease at the main attraction, and then the payoff is nothing short of spectacular. Gareth Edwards expertly directs the king of monsters return to the big screen in one of the most satisfying monster films in recent memory. I must admit that I have been looking forward to Godzilla for quite a while, whether it was the exciting cast or the extremely exciting prospect of seeing an Indie director who has only one film under his belt (2010’s Monsters). It all seemed like a fantastic prospect, then the trailers came out and those made me more excited and it’s great to see that all of that excitement paid off into one of the better summer blockbusters I have seen in the last few years. Godzilla is not free of faults the dialogue at times is clunky and some performances are less than stellar. While those are issues I will address, it’s safe to say Godzilla succeeds in many more places including its direction by the talented Gareth Edwards. Godzilla takes it’s time to reveal the titular character, you don’t get a full look at the king of monsters until nearly half way through the film. Instead of revealing Godzilla right away they wait until your begging to get a full look at the world’s most famous Kaiju then in the film’s final act Edwards gives you one of the finest climax’s we have seen in a summer blockbuster in some time. You get the battle you were begging for and so much more thanks to the amazing special effects and fantastic directing. Godzilla is more about the characters that are within the world of Godzilla and less about the creature itself. Bryan Cranston and Aaron Taylor Johnson play Joe and Ford Brody, 15 years after the accident that killed Joe’s wife Sandra (Juliette Binoche), Joe continues to believe that the government is covering up a much larger secret. Ford, a soldier who has just returned from war to his family including his wife (Elizabeth Olsen) and their son is forced to travel to Japan to free his father from jail after he was arrested trying to discover the secrets from the area where the accident occurred 15 years earlier. What they discover in Japan is the beginning of the chain reaction that brings Godzilla into the fold. Godzilla is not free of mistakes mostly from the script of Max Borenstein, some of the dialogue is clunky and doesn’t quite fit in and on top of that the character of Ford Brody whom is the main character and is the most underdeveloped member of the cast. The movie focuses on the relationship between Joe and Ford but leaves a 15 year window that remains unspoken for. When we meet grown up Ford he is a grizzled veteran and it seems Taylor Johnson’s only direction was to remain stone faced and talk seriously into the camera. The Kickass star doesn’t bring much in the way of personality as his character has to survive numerous action sequences and he never really finds a personality for his character. The other questionable aspect of Godzilla is they leave a talented Elizabeth Olsen on the bench for almost the entire film, totally unutilized; her character is only there to leave worrying phone calls and have less than 30 minutes of screen time. The attempt to be a movie about the characters surrounding the awesome power of the world’s most famous monster falls short and is the only thing that keeps Godzilla from A+ summer blockbuster status. 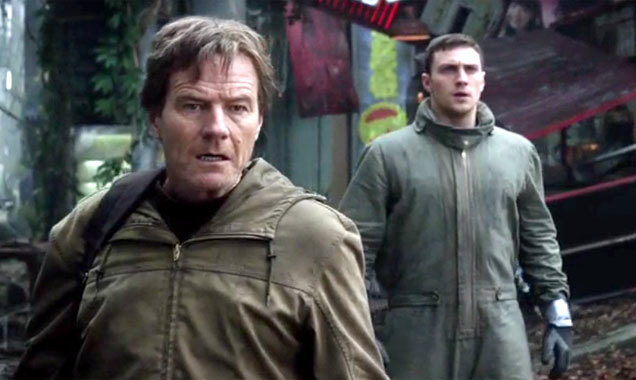 That being said thanks to Bryan Cranston as Crackpot Joe Brody and Ken Watanabe as the scientist who has been dealing with Godzilla and the MUTO or "Massive Unidentified Terrestrial Organism" throughout his career. Watanabe is a fantastic side character and was one of my favorite characters in the film. The main bad guy in Godzilla is MUTO, a parasite that feeds off of nuclear power is a magnificent monster created for the film that is a cross between some iconic Godzilla characters, and the monster from Cloverfield. Edwards allows us to see the MUTO destroy multiple cities before giving us a proper glimpse of Godzilla and it helps in discovering just how dangerous it is. Godzilla may not be the perfect Sci-Fi Monster thriller but it lives up to the classic TOHO masterpiece and very well may have launched the career of its director into stardom. Godzilla is a masterpiece in destruction and lets the king of the monsters live up to the billing. Godzilla is a must see, and thanks to the epic climax it is one of the better summer blockbusters you will see this year. On a scale of 1 to 10 I would give this movie a 4. I wish I could get a refund. All special effects and no story . Don't waste you money. GODZILLA WAS A WASTE OF TIME. Godzilla is hardly ever seen in the movie.